Your Optometrists in Allentown, PA. Call us at (610) 486-3285 today. Mission Statement: Lehigh Valley Eye Care Associates in Allentown is a full-service family eye care practice. We provide families with the best in preventative, routine and corrective eye care to maintain optimal eye health, and service our patients’ need for stylish and affordable eye wear. Our eye care specialists provide these services in a warm and caring environment, where we deliver the finest in professional vision care. Our Allentown eye clinic has provided insightful eye care services for over thirty years. Our current owner and optometrist, Dr. Tony Sankari, has been here for over ten years. He is joined by Dr. Nicholas Gidosh in offering the latest in medical diagnostic testing and treatment. Our optometrists take a one-on-one approach to optometry, explain the importance of regular eye care, and discuss available options to maintain optimal ocular health. Eye Exams: A regular eye exam uncovers possible problems and keeps eyes functioning at their best. Contact Lens Exams: Properly fitted contact lenses can make all the difference in visual acuity. Ortho K Lenses: Get better vision without surgery by wearing these lenses while sleeping. Specialty Contact Lenses: Find the lenses that are right for you, such as gas permeable, Scleral Lenses, or the Synergy Hybrid Contact Lens. Glasses/Frames: We offer the latest in optical designer eye wear to help you look your best. Glaucoma: This serious optic nerve condition can lead to blindness. Cataracts: Cataracts cause a film on the lens and blur vision. Dry Eyes: These occur when your eyes don't produce enough tears. Flashes/Floaters: These may indicate retinal problems. Itchy/Red Eyes: Itchy, red eyes may be caused by allergies or other health problems. 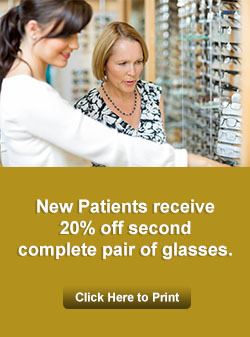 New Patient Specials: Great eye health begins with preventative eye exams. We welcome new patients with two new patient specials. 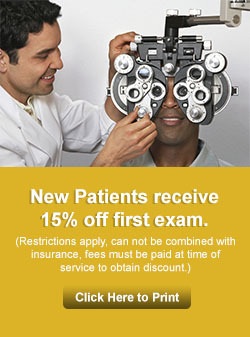 Find out how you can receive 15% off your first exam or 20% off a second pair of glasses. Our optometry clinic is located at 2030 W Tilghman Street, #101 in Allentown, PA 18104, and serves the areas of Lehigh Valley, Allentown, Whitehall, Bethlehem, and Easton. “Like” our Facebook page to receive regular tips on eye health. Call (610) 486-3285 to make an appointment. Your future suddenly became a whole lot clearer with Lehigh Valley Eye Care Associates! Very professional customer oriented business. They sell Quality eyeware at a competitive price. Very knowledgeable friendly staff. Top of the line Dr's & staff. There's no better feeling then the feeling of comfort & satisfaction from the time you check in to the time you check out! !